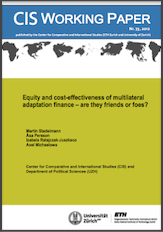 Equity and cost-effectiveness of multilateral adaptation finance-are they friends or foes? Home › Learn › Articles › Equity and cost-effectiveness of multilateral adaptation finance-are they friends or foes? This paper analyzes potential criteria to allocate international funding for adaptation to climate change, as a response to one of the main governance challenges of international adaptation funding the prioritization of project proposals given scarce funding. Based on the review of the equity and cost-effectiveness literature and relevant policy documents, we identify three potential indicators for equity (vulnerability level, poverty, equal funding per capita), and three indicators for cost effectiveness (economic savings in absolute and relative terms, human lives saved). Applying these simple indicators to information provided in all 39 project documents considered by the Adaptation Fund Board (AFB) in 2011, we find that projects approved or endorsed by the AFB rank high according to one cost-effectiveness indicator (absolute economic savings), while they rather rank low according to all equity and further cost-effectiveness indicators. Furthermore, we analyze whether equity and cost-effectiveness are two contradicting goals, or whether ways can be found to reconcile both goals in multilateral adaptation finance. We conclude from both the theory and the 39 analyzed project documents that a pure economic definition of cost-effectiveness tends to be in contradiction with equity but that trade-offs between equity and cost-effectiveness can be limited if relative economic savings or human live savings are used as indicator for cost-effectiveness.